Manufacturer of Electronic, Electrical Components & Parts. Wps is a wireless presentation gateway that connects Notebooks/PCs to any type of projectors, TV or Monitor for displaying high quality presentations. 1. 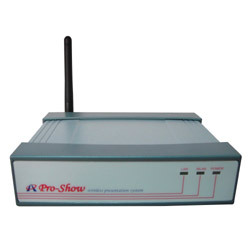 Wireless Presentation System WPS002: (1) Plug & play. (2) WPS is a plug-and-play device which is easy to install and connect with any Notebooks/PCs. (3) With built-in Centrino or Wi-Fi card can easily download driver and connect to WPS. 2. Flexibility: WPS is compatible to all kinds of projectors, using wire-line or wireless connection, to display presentations. Instantly project your screen to the projector with just one mouse click. No more cable swapping hassles. 3. Performance: WPS has the ability to deliver real time video streaming for up to 1024x768 resolutions. It also provides friendly web-based administrating UI for easy configuration and wireless security setups. 4. Security: Support Login code to protect other users from accessing presentation contents. During presentation, screen images can also be protected by WEP 64/128 encryption.